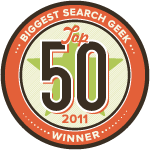 Marin Software holds an annual ‘Biggest Search Geek‘ contest on their site to promote their brand and SMX (Search Marketing Expo). Being lured by the sweetness of their grand prize (all expense paid trip to SMX ’12 + iPad 2), I got suckered in to taking the test. 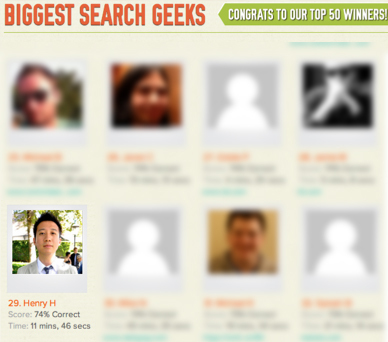 Unfortunately, I’m not geek enough to win the grand prize (or runner up prizes), I did place 29th on the leader board. Seeing that there were more than 2,000 entries, I couldn’t help but tout this achievement. For those math junkies out there, that would place me in the top 1% (yes, I rounded).